My take: Wow! This book rocked!!! I pretty much knew the moment I picked up this book that it would be one of the darkest books I’ve read in a while, and I was right. I wouldn’t say that it’s as dark as it is scary, but this book takes place in a horribly dark world. A lot of people have characterized this book as a vampire book, but the creatures in Black City are called Darklings. And, in my opinion, Darkling is a much better word for them because they are a different type of creature altogether. The twist in Black City is purely epic! I was completely shocked, stunned, and left sitting in utter disbelief. Get the picture? The twist is easily the best (or at least one of the best!) story twists I have ever read. 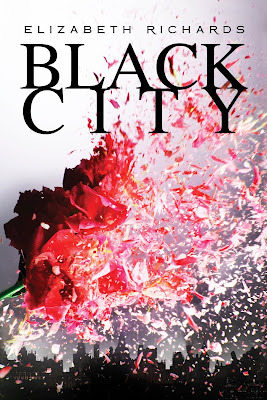 Not only was I was caught totally off guard by it, but it brought about many different new complications to the story, which made Black City even more amazing that it already was. Both Natalie and Ash are great characters. They are from two completely different worlds and their lives collide, literally, in the very first scene of the book. Black City alternates between the POV’s of Ash and Natalie, and it was the perfect balance that kept me entertained from the very beginning to the very last page. Black City ends in an awesome cliffhanger but, at the same time, it gives you a little taste of where the story is headed so you’re not left completely out in the dark. I can hardly wait to see what other people think of this one. I am so so so excited to read this book! I heave heard such great things about it. Great review! Great review! I really look forward to reading this myself! Hmm... I guess everyone's loving this book more than I did. I actually found it a little too predictable, and that's what drove me to not liking it as much as I wanted to. But I do think there are going to be plenty more people who love it more than I did. This sounds so good!! There is so much hype surrounding this book that I am almost afraid of it, but knowing that you loved it makes me a little less scared. Great review! I'm dying to read this one !! I really have to order a copy !! Thanks for the great review Mindy ! !